SAW019576 SCOTLAND (1948). Forth Rail Bridge and Hawes Pier, South Queensferry. An oblique aerial photograph taken facing south. This image has been produced from a print. Title [SAW019576] Forth Rail Bridge and Hawes Pier, South Queensferry. An oblique aerial photograph taken facing south. This image has been produced from a print. Passenger Ferry at Hawes Pier in South Queensferry. The ferry continued to operate until the new road bridge opened in 1964. The new road crossing now under construction will be really magnificent. It's amazing to think that the scene in this photo (ie a ferry) had been going for centuries before and is still well within living memory. 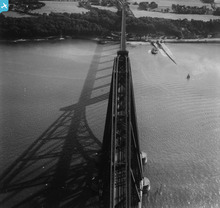 Until 1964 if you didn't use the ferry at Quuensferry the next crossing over the Forth was at Kincardine about 20 miles upstream and the first road crossing point over the Forth. 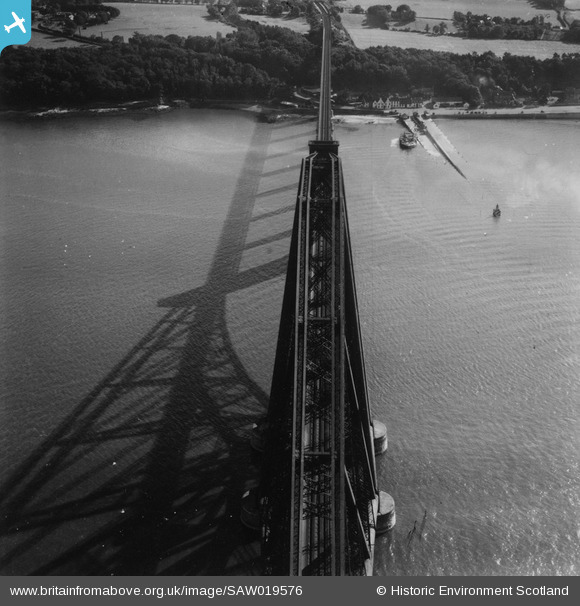 The new bridge really did change life in 1964! this is either "Queen Margaret" or "Robert the Bruce" if this photo is 1948. The third ferry ("Dundee") had a single large funnel.